One reason the U. S. Congress is so dysfunctional is that the leadership of the Republican majority in the House of Representatives cannot control its own caucus. This is due in part to gerrymandered districts that leave extreme members virtually guaranteed of re-election, and so without any need to be responsive to party discipline in the House, and also in part to reforms (such as restrictions on committee appointments and abolition of earmarks members could use to bring pork home to their districts) that have sharply limited the leadership’s ability either to punish or reward its members. As a result, the leadership is unable to pass legislation it proposes itself, if it is opposed by the extreme right-wing faction within its caucus, without relying on Democratic votes to do it. It is difficult for the Republicans to rely on Democratic votes to pass legislation, because (1) the Democrats usually will not support the reckless, harmful, unjust, and generally vile measures the Republicans propose these days, and (2) even if they do support a Republican proposal (for example a technical measure to extend funding for a government department the Republicans would like to express their pique by shutting down), the so-called Hastert Rule (named for a previous undistinguished Republican Speaker) forbids the Speaker, under pain of outrage in his own caucus, to bring any measure to a vote that will not pass with Republican votes only. There has been talk of replacing Speaker Boehner because he is unable to manage his caucus, but the problem there is that no other member is likely to do any better, and anyway the highest-placed members of the Republican leadership are loyal to Boehner. Since you can’t beat a horse with no horse, the Republicans are likely to have to stay with ineffective leadership and depend on the Democrats to do anything. I view this as a good thing, because effective leadership would just make the Republicans even more dangerous than they are now. They are bad enough when they can’t do anything – think how bad they would be if they got their act together! But just as an idle thought, suppose the Republicans could find someone who commanded enough respect in their caucus that most members would conform? Who might that be? St. Ronald Reagan (peace be upon him) is the obvious candidate, but has the disadvantage of having been dead for more than 10 years. Even dead he would probably be a more effective Speaker than Boehner, but he could not take the oath of office. But wait! There is one person who reflects enough of Reagan’s glory to do this job, and is not dead. 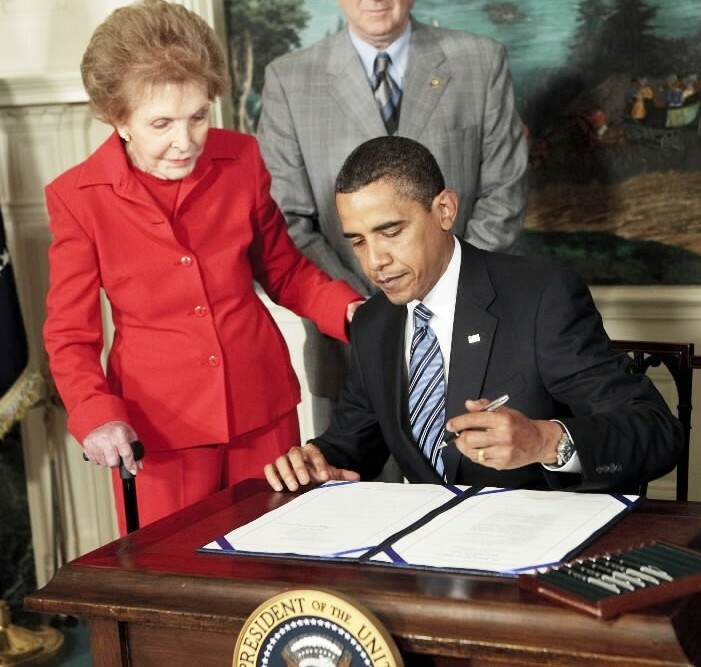 I speak of course of Nancy Reagan, only 93 as I write this. True, she is not a Member of the House, but the Constitution does not require that the Speaker be a Member. It says only (in Article I § 3) that the Members may choose the Speaker, and the Clerk of the House confirms that although all past Speakers have been Members, membership is not required. So Boehner is deposed, the caucus elects Mrs. Reagan, and the next time the leadership recommends a measure the right-wingers oppose, Mrs. Reagan goes on television, sitting in a cozy armchair beside a cozy fire, with an afghan quilt over her knees, and says in a firm voice (but with just a hint of a touching quaver) that she just knows that Ronnie would want them to vote for it, and indeed would always want them to follow their leadership. And then which reactionary Republican would dare to disobey her? An act of disrespect for Nancy (or Ronald) might play very badly in his 80% Republican district back in Oklahoma. Defying the current Speaker makes no difference, but many would hesitate to defy Nancy, the keeper of the Reagan flame. There would be at least a possibility of a primary challenge from a Reaganite – why risk that? This strategy would not ensure 100% obedience – there might be a member here or there voting from principle rather than electoral anxiety – but as usual there would not be enough of them to make a difference. The leadership, huddled for protection behind the skirts of Mrs. Reagan’s Oscar de la Renta dress or red tailored suit, would be able to govern at last, with who knows what catastrophic consequences for our country.